Last December, my youngest daughter and I had the best mother-daughter Christmas night together. We got dressed up (and bundled up!) and rode the metro to downtown DC to the historic Warner Theater where we watched The Washington Ballet’s Nutcracker. I am so excited to be returning to the Warner Theater this holiday season with my good friend for a fun girl’s night out. To top it off, I get to give away two additional tickets for a reader to see the show this season as well! Tickets were provided for myself and for the giveaway, but all thoughts are my own. This celebrated production has become DC’s perennial holiday favorite! Set in historic Georgetown with historical figures and whimsical touches. This sumptuous production showcases the grandeur of The Washington Ballet’s international roster of dancers and majestic Tchaikovsky score. Replete with swirling snowflakes, cherry blossoms and historic characters including George Washington as the Nutcracker and King George III as the menacing Rat King! Join us again with family and friends or start a new holiday tradition with your loved ones. Presented at both THEARC and downtown Warner Theatre. One winner will be able to choose a performance to see The Washington Ballet Perform Septime Webre’s The Nutcracker (available dates: Wednesdays-Saturdays, December 3-18). Please note that travel is not covered, so please only enter if you are within driving distance of the Warner Theater and can get yourself to the theater in December. This giveaway will close on November 30 at 11:59 pm ET, after which a winner will be chosen at random and notified via email. The winner will be emailed a voucher with instructions for reserving tickets. Tickets can then be picked up at will call on the night of the performance that they’ve chosen. Good luck, everyone! 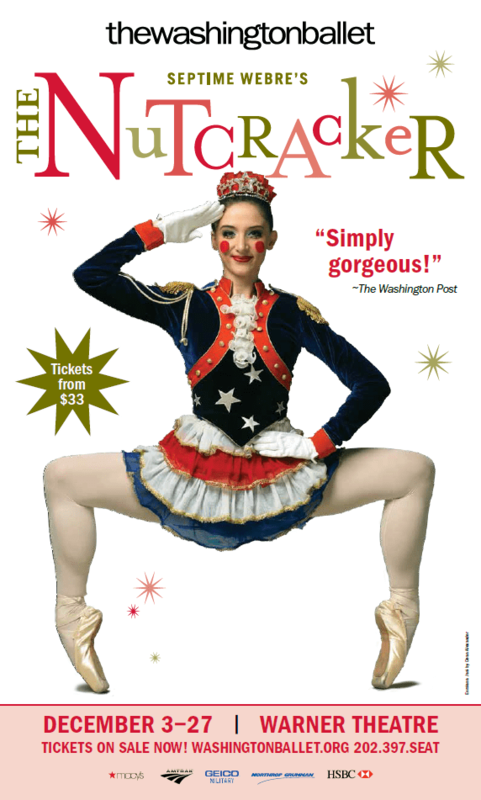 I would love a chance to take my daughter to see the Nutcracker. We’ve only seen the movie and read the book. I think seeing it live would open a whole new adventurous door for her!